I am already using an iPad but not happy with its internal storage capacity and with this much storage capacity,I can't travel because I like watching movies.I want to attach or add an external hard drive so as to store as much movies as possible.is there any way to add some extra space with the help of external hard drive? If yes then how? Kindly provide some information about it. Is it possible to use Seagate wireless hard drive with iPad 2? Is there any provision for adding more space in iPad through external flash memory card? 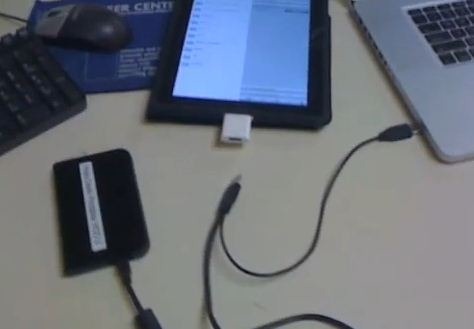 Re: How to add an external Hard Drive in an iPad? If you want to Add External memory to your ipad then you can use the External SD cards to expand and extend the video storage and memory storage capacity. So you can easily do the Expansion of the memory of your ipad. You can also do by connecting the External Hard Drive or Disk to your ipad. The connection of external hard drive and disk can be made through the cable connection. So you can store as much many files you want to store in your ipad. if you mean the external hard disk means just giving the external memory with ipad temporally.by using some devices just like card readers by just inserting them in the provided slot on the ipad's side part.and we can have the another type of external hard is nothing but external disk drive.by using the cable connection can connect the external hard disk to your ipad. You can also now use it it to connect an external hard drive with your ipad for extra storage ..
>> Just Try Above Step Then You Will Increase The Memory Of The iPad And Performance.